I received my first Cozy Reader Box in the mail this week. My husband is a little worried about the boxes, but I promise there aren’t any more, my dear! I really loved this box. Take a peek inside. 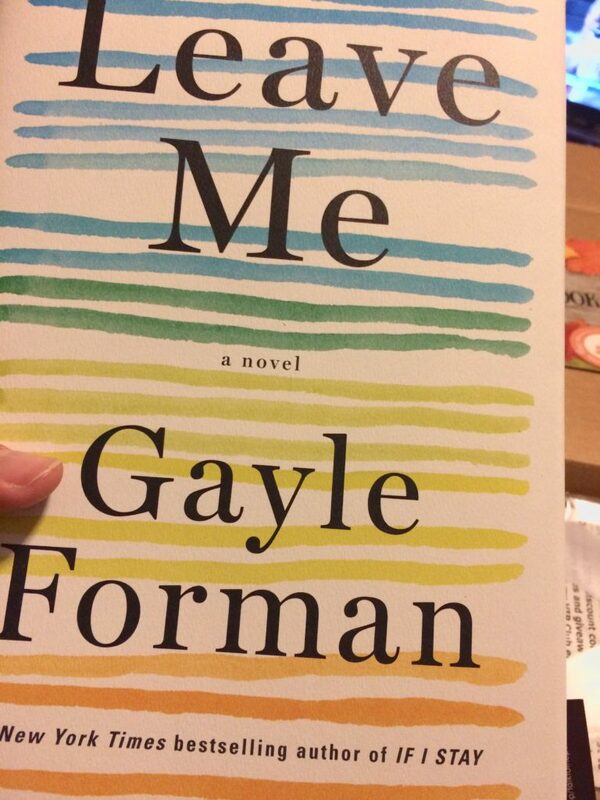 First up, a hardcover of Gayle Forman’s Leave Me. 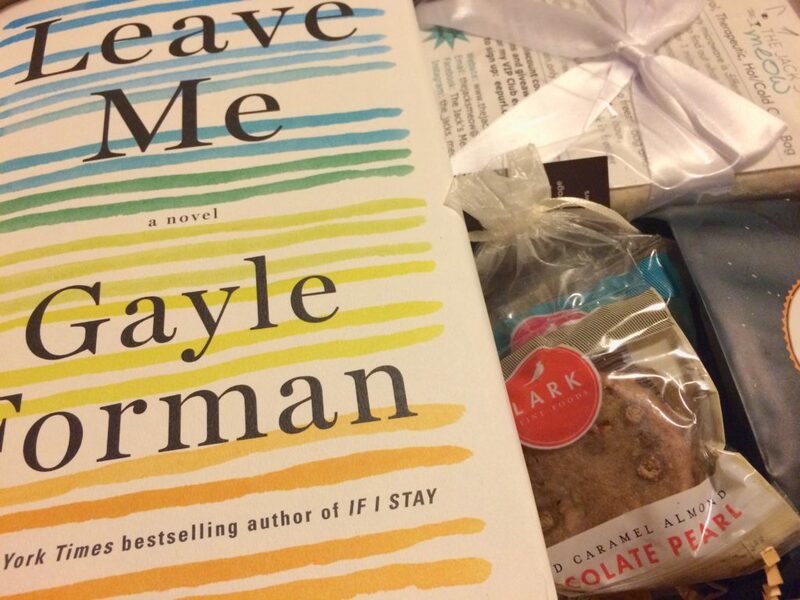 I have read both If I Stay and Where She Went, Forman’s YA books, and loved them. This is her first novel for adults. I loved this bracelet from Lily Brooke Vintage. I usually can’t wear bracelets because my wrists are small, and unless I get them sized especially for me or they are adjustable, they just slip off. 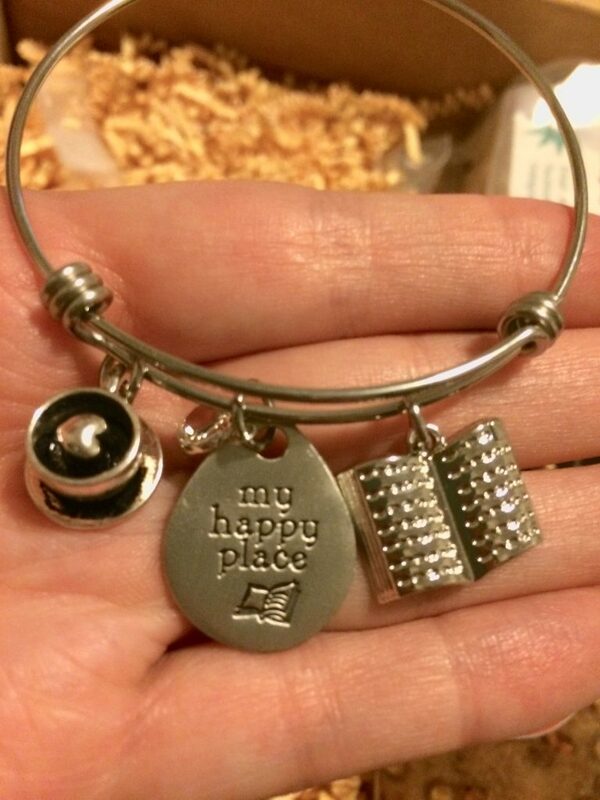 This bracelet, however, fits just fine. It jingles pleasantly when I wear it, too. I love it. 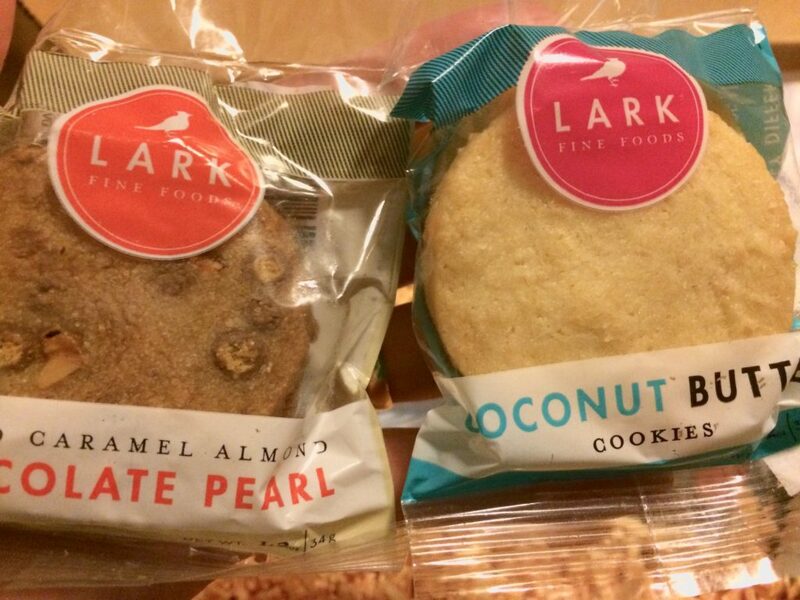 Some yummy-looking gourmet cookies from Lark. I have never seen these before. Coconut Butter and Salted Caramel Almond Chocolate Pearl. They look delicious! 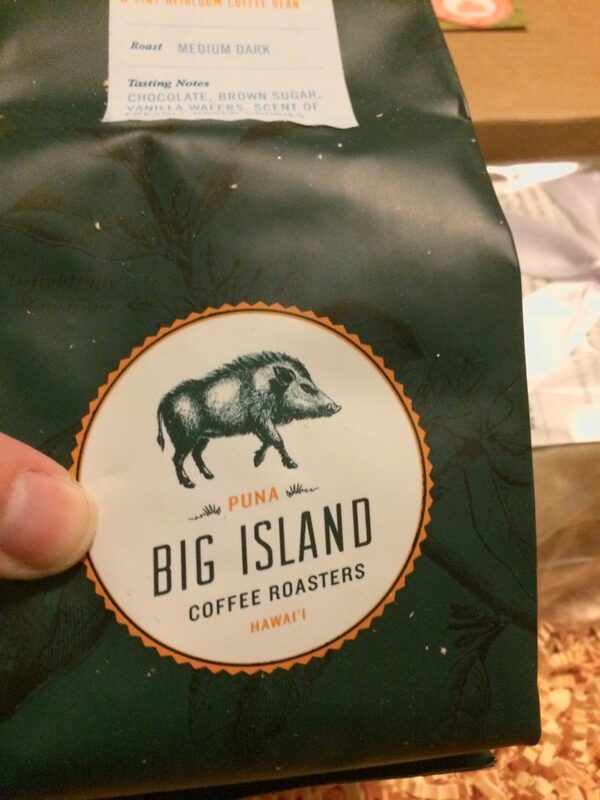 A package of whole coffee beans from Big Island Coffee Roasters. I am not the most savvy coffee drinker, but I hear that Hawaiian coffee is supposed to be very good. We tried some for breakfast this morning, and it’s delicious. I cut the flavor out when I took the picture, but it’s Maui Mokka with notes of “chocolate, brown sugar, and the aroma of baking cookies.” Mmm! They also sent along a coffee lip balm. 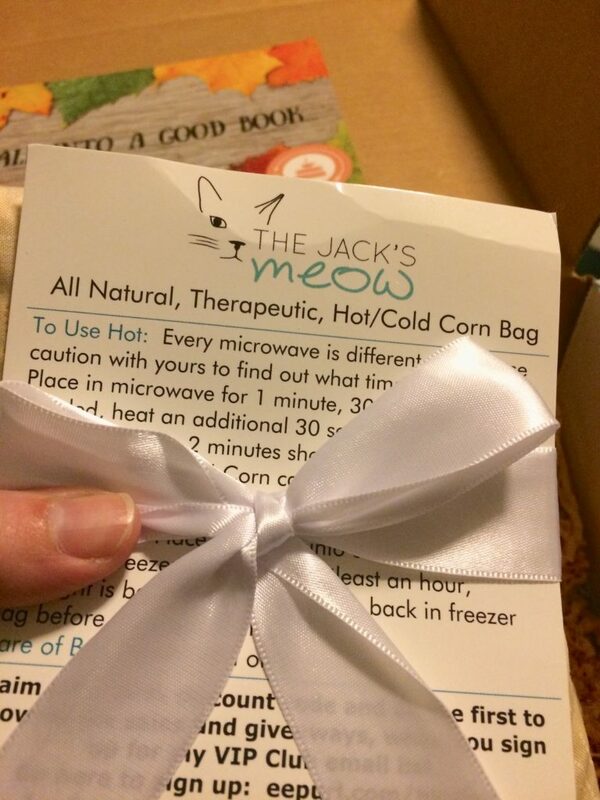 Finally, a therapeutic hot/cold corn bag from the Jack’s Meow. I had something like this before that I bought from a craft show, and it was great. You can use it warm—just heat it up in the microwave and put it on whatever spot is sore. You can also use this one cold. Put it in a freezer bag and let it get nice and cold in the freezer. In addition, most of these folks included discount codes good in their stories for future purchases. The box includes a handy card detailing the contents, including retail price for each. It could be argued that some of the items might be purchased for less than retail (certainly the book could be). Still, the items add up to about $20 more than I paid for the box, and I doubt I would have been able to do better than that, even if I wasn’t paying retail. I liked everything in this box, especially that bracelet. The box is perfectly named, too—just the sort of cozy comforts a book nerd would want, but not necessarily the things you’d think to get for yourself. Love it! 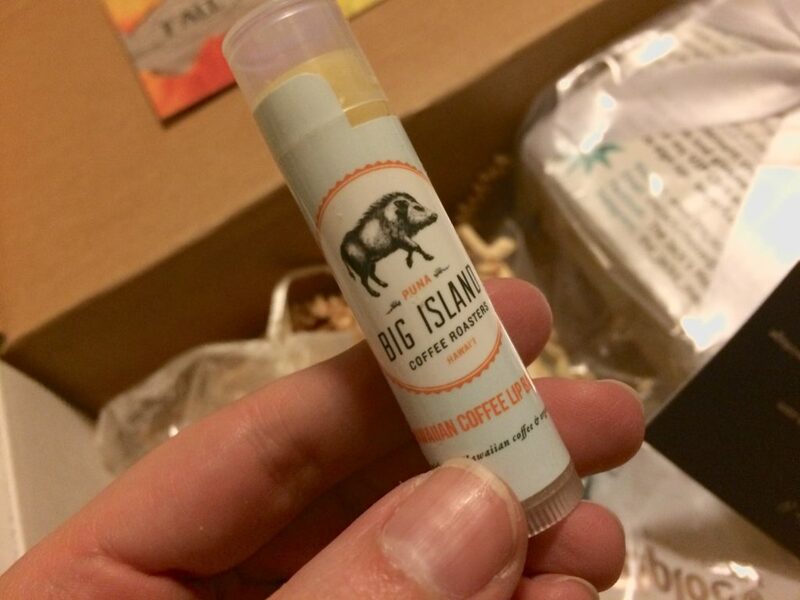 How is the coffee lip balm? Is it made with coffee, or is it just coffee-scented? Both! It has a coffee infusion.